60.00 The magician displays a tri-folded restaurant menu. 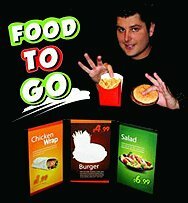 He displays the menu on both sides, folds it into a triangle, and then reaches inside and produces a burger, fries, or even a bottle of Coke! This beautiful rendition of the classic Temple Screen trick provides a full-color menu that packs flat and yet is large and visible in appearance. Sorry, no hamburger or fries included. We suggest McDonalds. 95.00 A beautifully painted tube is shown all around. 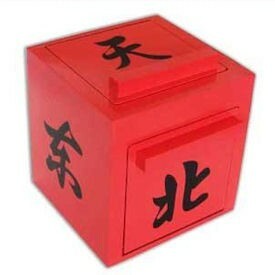 It is then hinged open as per the illustration to show that it is completely empty. The tube is closed and a large production of silk handkerchiefs commences. This tube is extremely well made, very deceptive, and works well even at close quarters. 125.00 This is a very well-built piece of magic that is made by the Illusion Warehouse. 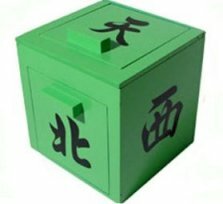 The box is opened as per the illustration and the audience can easily see that it is empty. 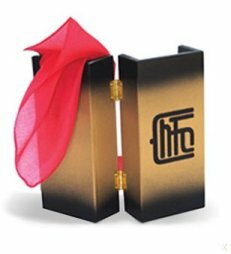 The box is closed and the production of silk handkerchiefs, mouth coils, and other items are produced out of the top of the box. Our Gung Ho features 3/8" Finland birch luan with formica type laminate finish. The sides of each box are black and the outermost of each door is a natural wood grain. 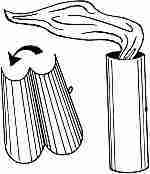 750.00 This dynamic production effect was created by the late Jack Gwynne. Gwynne used it in his vaudeville act for many years because of the effect's mobility and the fact that it can be performed almost surrounded. The audience sees a three fold screen. Sitting on top of the screen is a tray. 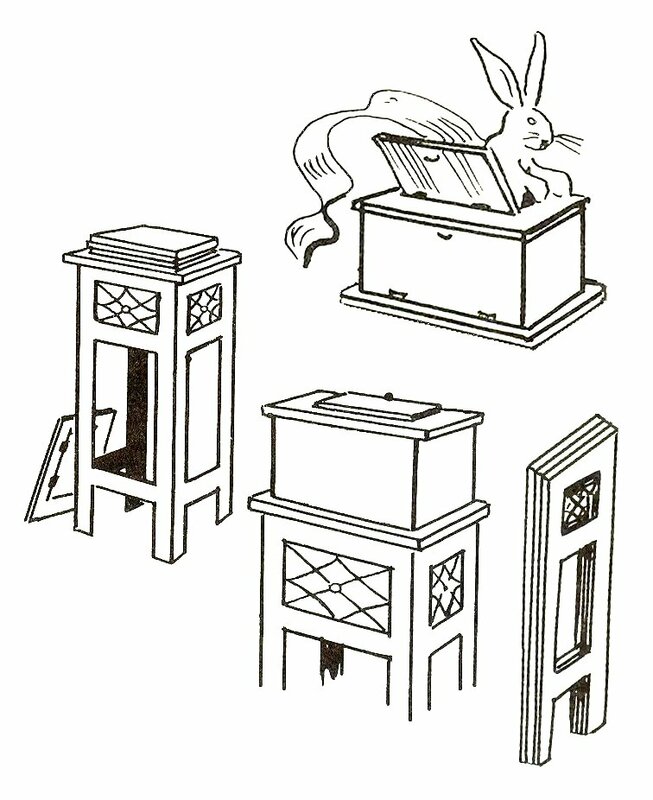 The magician proceeds to assemble a box on top of the tray by hinging up the back, two sides, the front, and finishing the cabinet by placing on the top. 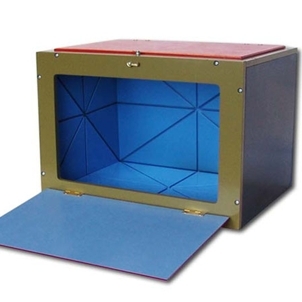 The magician then lifts the tray and box up off the screen and shows the rear of the screen. The box is placed back down on top of the screen. 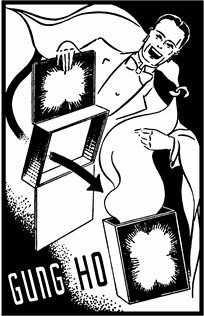 The magician then opens the box top door, and proceeds to produce a huge load of silk hanks, livestock, and or other production items. This beautifully built piece of apparatus features 3/8" birch luan and formica type laminate finish. It is a first-class prop through and through, and proudly made by Chadwick Illusion Fabrications on a custom-built basis. 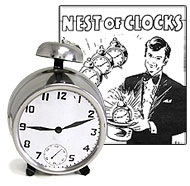 75.00 The magician reaches into his favorite production apparatus and produces a bright shiny polished aluminum alarm clock! A second clock is then produced. Then a third, forth, until six clocks are produced! This is not a trick in itself, but rather a wonderful production item. Thanks to the fact that each clock is hollow and each nests within the other, very little room is taken up in your production apparatus. Nicely made. 25.00 A beautifully polished metal tube is shown empty. Each end of the tube can be capped-off with paper if you like. The paper is broken open and a large amount of silk handkerchiefs are produced! The phantom tube principle is a very old secret in magic that is very deceptive. This tube will allow you to produce several twelve inch silk handkerchiefs. This is excellent magic for the beginner or professional.